Removal and replacement of surface mount and through hole components is one of the most common rework processes performed on assembled circuit boards. Although commonplace and sometimes routine, today's component packages and board features present an array of difficult component rework challenges. We have over 100 pieces of equipment from Pace, Metcal and OK Industries, Air-Vac, and Electrovert to meet most any surface mount, BGA, and through hole component rework need. Our trained and qualified technicians are ready to tackle your toughest rework projects. We have the best equipment available to meet most any surface mount, BGA, and through hole component rework need. Our trained and qualified technicians are ready to tackle your toughest rework projects. Refer to our Rework Procedures for detailed information. We use a mix of convection and conduction techniques for surface mount component removal. Many factors are considered, but normally conduction methods are used to remove smaller components. Convection techniques are commonly used to remove larger, more sensitive components. Point to point soldering methods are normally used to replace surface mount components. We use vacuum desoldering systems for small through hole removal projects. We call upon our Electrovert Solder Fountain Systems for demanding multi-lead rework projects. These systems take great skill and experience to operate, but for high pin count through hole component rework, these workhorses can't be beat for reliability and efficiency. We can salvage most components for reuse. List of component removal and rewok procedures including removal of through hole components, removal of chip components, removal of J lead components and removal of gull wing components. Procedure covers removal of through hole components on assembled circuit boards. 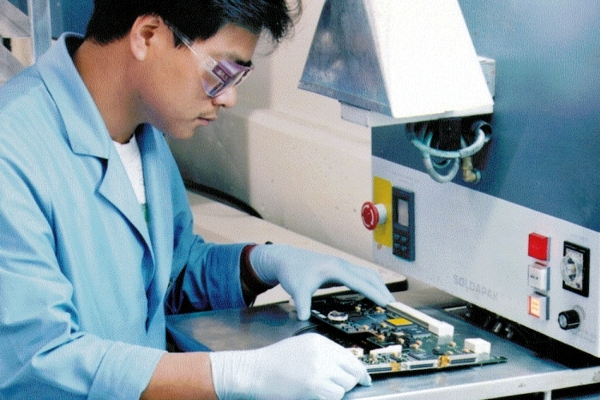 Procedure covers removal of surface mount chip components on assembled circuit boards. Procedure covers removal of surface mount J lead components on assembled circuit boards. Procedure covers removal of surface mount gull wing components on assembled circuit boards.